AHS: Red, white and BLUE HAIRED EVAN PETERS!? Ladies and Gentlemen, I have gathered you all here today to talk about our Lord and Saviour Evan Peters and his hair. As you know, American Horror Story season seven is just around the corner and Ryan Murphy has just set up an Instagram account to tease us about it. 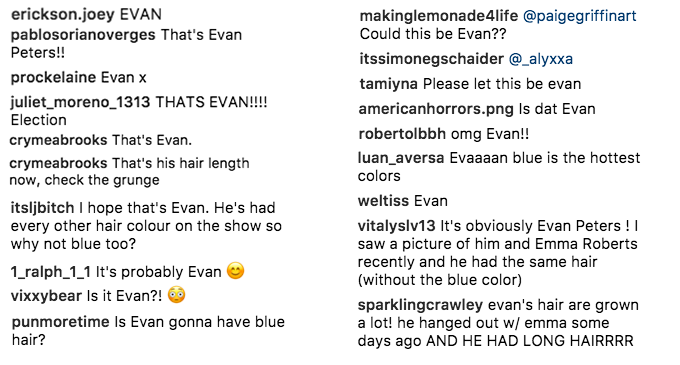 He uploaded a picture of some blue hair a few weeks ago that everyone assumed to be Evan Peters and now... the conspiracy has come true. Evan Peters has had literally every hair colour under the sun over the past six seasons of American Horror Story. He has been a blonde (twice). He has been a brunette (twice). He's been a very very dark brown, some may even say ~black~. So when Ryan Murphy shared THIS photo of someone's blue hair and captioned it "AHS: Red, white and blue clue", it sent everyone into a state of Evan Peters-themed panic. And now, a few weeks after uploading that teaser snap, it's been confirmed that Evan Peters WILL be rocking blue hair for the seventh season of American Horror Story. Where were you when Evan Peters invented the blue Man Bun? 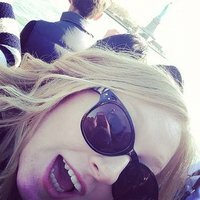 Evan is not the only cast member to have dyed their hair for their role in the seventh season of AHS either; Billie Lourd recently went full witchy white for the gig which leaves only the red slot to be filled in Murphy's 'Red, White and Blue' clue. Ginger Sarah Paulson? Our bodies are ready.